Liebherr has started to provide rescue sheets for its mobile cranes in order to assist with crane recovery following an incident. All Liebherr LTM and LTC cranes which comply with stage 3b or higher emissions will now come with a rescue sheet as standard. 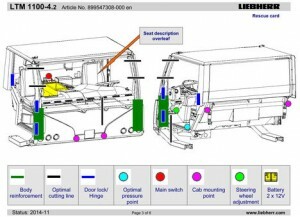 Available separately and located behind the driver’s seat, the rescue sheet provides detailed information about the structure of the crane and its cab as well as the best places to cut the bodywork open in order to free a trapped operator. It also provides information on the locations, volumes and hazard classes of the crane’s fuel and oil. Rescue sheets have been available for new cars, commercial vehicles and trucks for some time now, although cranes are a niche product and relatively unknown to fire and emergency services. Liebherr said the aim of the rescue sheets is to enable the fast rescue of passengers and the safe recovery of the crane following an incident.